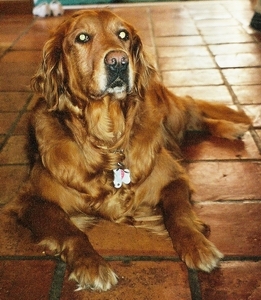 We are saddened to share with you all the loss of our sweet Amber on August 26th (adopted Nov. 2004). A tumor around her spine paralyzed her hindquarters. She was a playful companion to our collie, Kaleb, after the loss of our 13 year old golden, Jasper. Amber had the energy, spirit and playfulness of a puppy. She entertained us daily with her antics, frolicking about with "Rainbow Snake", her favorite toy. Amber was an instant friend to Kaleb and our "Forever" golden, Max (Chester). She brought joy and laughter into our home for the 21 months we had her with us. Looking forward to meeting you all again at the rescue parade next year.